Personal: Gothenburg, Sweden resident was born in Espoo, Finland...Began bowling with two hands as a toddler. 2018:Finished 13th in Roth-Holman Doubles Championship with Dom Barrett. Career: In 2016 finished second in Kingdom of Bahrain Open losing to eventual winner 16-year-old amateur Ahmed Al Awadi of Bahrain 470-454 in championship match...In 2015 won Bowling World Open in Japan for fifth PBA Tour title by defeating Isao Yamamoto of Japan 248-224 in championship match. Finished fifth in H.H. Emir Cup. Teamed with Dom Barrett to finish second in Roth/Holman Doubles losing to Norm Duke and Wes Malott in championship match 228-203...In 2014 won World Bowling Tour Thailand tournament for fourth career PBA Tour title by defeating Ryan Ciminelli 243-334 in championship match...In 2012-13, Finished second in World Series of Bowling Bowlers Journal Scorpion Championship, losing to Tom Daugherty in the championship match 200-182. Finished fifth in Tournament of Champions...In 2011-12 Palermaa became the first international player, and the first two-handed bowler, to win the PBA World Championship when he defeated Ryan Shafer of Horseheads, N.Y., 203-177, in the season’s first major championship. Also made PBA history by winning Kuwait Open to become first player to win a PBA title under new PBA/WTBA alliance. He defeated Tom Smallwood in two-game final stepladder match 267-232 and 268-226...In 2010-11 he won the GEICO Shark Championship for first Tour title and became second player with two-handed delivery to win a title (Jason Belmonte was first). Also finished fourth in PBA World Championship and seventh in Tournament of Champions...Finished fifth in 2004 U.S. 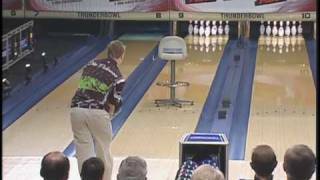 Open...Owns one PBA regional title. 2015 - Bowling World Open, Japan. 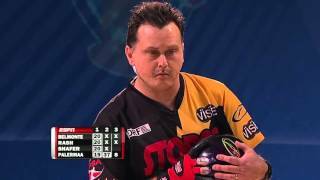 2011-12 - PBA World Championship. Named 2006 World Bowling Writers Bowler of the Year...Named Finnish Bowler of the Year in 2008 and 2009. Has won numerous medals in international competition...Won 2009 WTBA World Ranking Masters…Won 2008 QubicaAMF World Cup…Two-time EBT Bowler of the Year...Won gold medal in 2013 World Games singles competition...Inducted into World Bowling Writers International Bowling Hall of Fame in 2013.